We get it. Toilet clogs are disgusting, and they’re something that none of us really want to deal with. Sadly, they’re a fact of life. As your Hagerstown plumber, we are always here to help with all of your plumbing woes, but in most cases, you can unclog your toilet yourself. 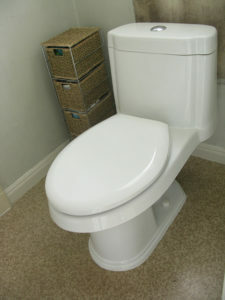 With a few basic household supplies and some basic know-how, you can usually get your toilet flowing again in no time. Roll up your sleeves, and let’s get to work! If you don’t already have a plunger in your home, a clogged toilet is the universe’s way of letting you know you need to buy one. Having a plunger on hand could save you from a flooded bathroom and help you avoid needing to call the plumber. Make sure your plunger seals securely to the bottom of the bowl. If you’re having trouble getting a good seal, spread some petroleum jelly on the plunger’s rim. Make sure the top of the plunger is fully submerged, and plunge away! If you’ve ever helped your kids make a baking soda and vinegar volcano, you already know a great way to bust up clogs in your toilet drain. Boil a large pot of water, and let cool for about five minutes. Pour one cup of baking soda into your toilet, followed immediately by two cups of vinegar. Add the water, being careful not to overflow the bowl. All the solution to work for several hours. Unless you have a particularly stubborn clog, this should get things moving again. Plumbing snakes can be a bit messy, but they’re the best DIY method for clearing stubborn clogs. Feed the end of the snake into your toilet, and twist the handle to dislodge the clog. When removing the flexible end from your toilet, do so slowly to avoid flinging nasty water and debris all over your bathroom. Sometimes, even the most seasoned do-it-yourselfer just can’t seem to get rid of a toilet clog. If you’re tried all the methods above and your toilet still isn’t flushing (or you’d like to avoid the potential mess of trying to clear a clog yourself), call the experts right here at Larry & Sons. We’re equipped the handle even the most stubborn clogs, and we won’t leave behind a disgusting mess. If you need help with a clogged toilet in Hagerstown, call 301-733-5428 or contact us online.